Trailers are an incredibly useful piece of equipment for car and van owners to have, they are easy to use and are versatile in their function. Making sure you have adequate and suitable insurance with the right provider like Adrian Flux is important in the event of an incident. Whether your trailer spends its days in your garage, on the driveway or on the road being used daily, Adrian Flux has trailer insurance to cover you. Our insurance rates for trailers are competitive, and our cover is comprehensive giving you protection and peace of mind. What features of Adrian Flux's policy will benefit me? 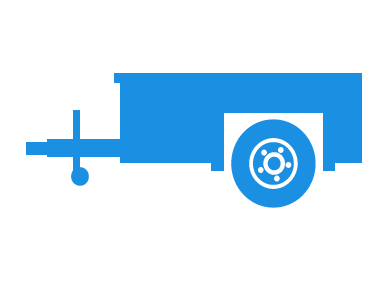 The weight of the trailer and contents must be within the vehicle's towing ability and not more than 85% of the car's kerb weight if the trailer has brakes, or 50% if it doesn't.